On Feb 11 2013, Dr Len Almond came to the university to talk to our students about TGfU, the original ideas that informed the approach, and where he felt we should be going in the future. It was a very stimulating talk, and I’ve tried to summarise what were, to me, the main points below. > Focusing on a much smaller range of possible techniques than is normal. Create a 6-week unit of work for complete beginners in one of the four game forms drawing on the pedagogical principles of exaggeration, representation, tactical complexity and sampling. 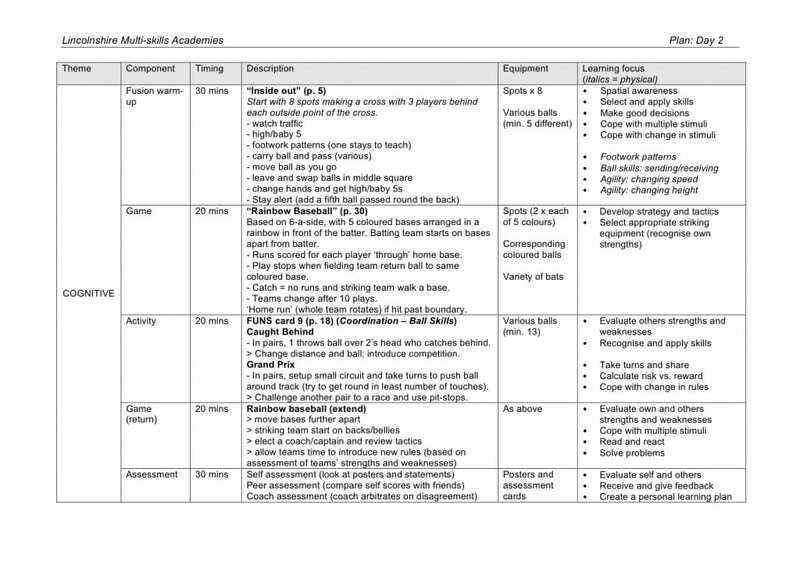 In order to assist them in their task, the students were given a map of the basic tactical principles involved in each sport form along with a slide to suggest ways in which they might modify their games to using the pedagogical principles (see below). Below I have summarised the output under the headings of the game forms. I include the unit plans developed by each group and some videos of selected games they decided to demonstrate. The group decided to have a indoor golf-themed unit of work, and devised the following games. Some example videos show how two of the games might work. This group decided to have a tennis-themed unit of work, and devised the following games. Some example videos show how two of the games might work. This group decided to have a baseball-themed unit of work, and devised the following games. The example videos show how two of the games might work. This group decided to have a netball-themed unit of work, and devised the following games. The example videos show how two of the games might work. I also asked that the students to think ahead, into the following few years, to suggest how they might draw on Bruner’s notion of the spiral curriculum to develop a longer-term series of units that, over time, would form a whole school PE curriculum. By way of example, I’ve created an outline for invasion games PE curriculum over three years, below. The students drew on two main resources for inspiration in developing their units. First, the original text by Thorpe, Bunker and Almond from 1986 that contains example units of work for basketball and tennis; and second, Mitchell, Oslin and Griffin’s 2005 text on Teaching Sports Concepts and Skills. However, most of their games are original and they tried hard to show how each game met the requirements we’d set out for simple game forms (reduced tactical complexity, more opportunities for success, focus on a small set of techniques). Of course, we’ll never really know if the unit plans are effective until we try them out in schools, but I hope that, if Len were to have seen our games, he’d be satisfied that we were moving in the right direction. That is to say, I hope we’ve been able to capture the original intentions and spirit of the TGfU movement in our short experiment. I was recently at an event for PE teachers, the purpose of which was to collectively design a new curriculum for PE in the county. No small feat! On the day, various groups of teachers were tasked with developing schemes of work for different sports to cover an entire key stage (or three years). Many of the teachers were experienced in such matters, but nevertheless struggled with the task. They tended to fall back on existing schemes for given sports, ignoring, to a large degree, the new guidelines that had been laid out for the new curriculum. What struck me most, however, was the general lack of thought and discussion going on in the room. Much of this was due, no doubt, to the tight time frame allowed to complete the task, but guiding principles were also conspicuous by their absence. So I began to wonder: what could have helped the teachers in their task? And do coaches face the same sorts of problems in organising seasons of work? My answer below is twofold: yes and yes. And to help me answer these questions, I draw on and combine two important ideas in education: ‘the spiral curriculum’ and ‘threshold concepts’. I have to confess, as a young coach I tended to work in a mainly reactive fashion: dealing each week with what went wrong in last week’s game; only working proactively briefly at each end of a season. Even in developmental coaching, I’d rarely plan more than eight weeks at a time, and then it would be based around coaching fundamental skills, one-by-one, in a fairly boring and predictable manner. It was not until I came across the work of the great Harvard educational psychologist, Jerome Bruner, who had much to say about developmental curricula, that I really began to think deeply and coherently about how I organised my terms and seasons of work. One of Bruner’s main insights for me, was the need to think about and focus on what’s really important in learning a subject, right from the earliest contact. One of Bruner’s most important related ideas was the spiral curriculum: a method of designing a course of work around basic yet fundamentally important and recurring themes in a discipline. Bruner was involved in reforming science education in the US in the 1950s and 60s and applied this concept in the highly successful and acclaimed programme, Man: A Course of Study. Below, Bruner explains how fundamental themes in science might be taught to very young children in an ‘intellectually honest’ fashion. This ‘shapelessness’ was what I had seen at the teachers’ workshop. I therefore wondered if the notion of the spiral curriculum might have helped the PE teachers develop a more effective and original set of plans to teach three years of basketball, for example, to KS3 children. 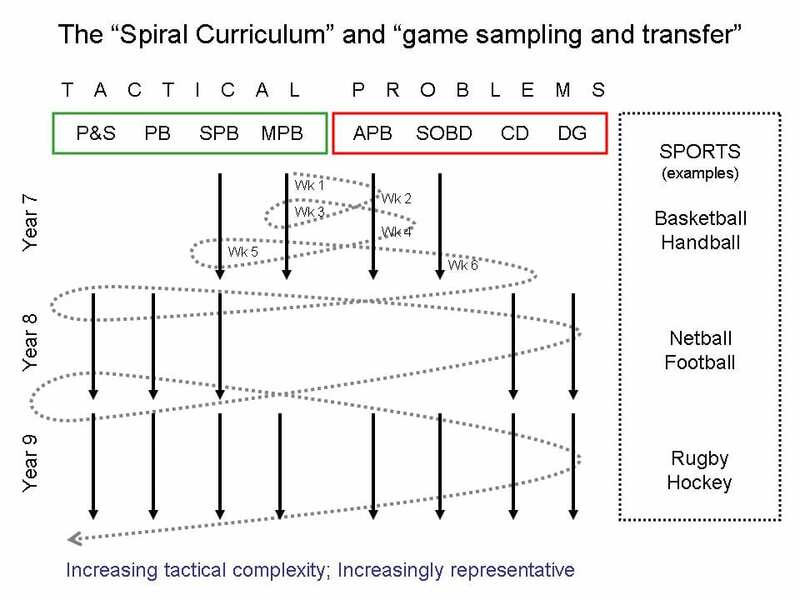 Here is my sketch showing how the idea of the spiral curriculum could help shape three terms of work in a given sport (figure 1, below). 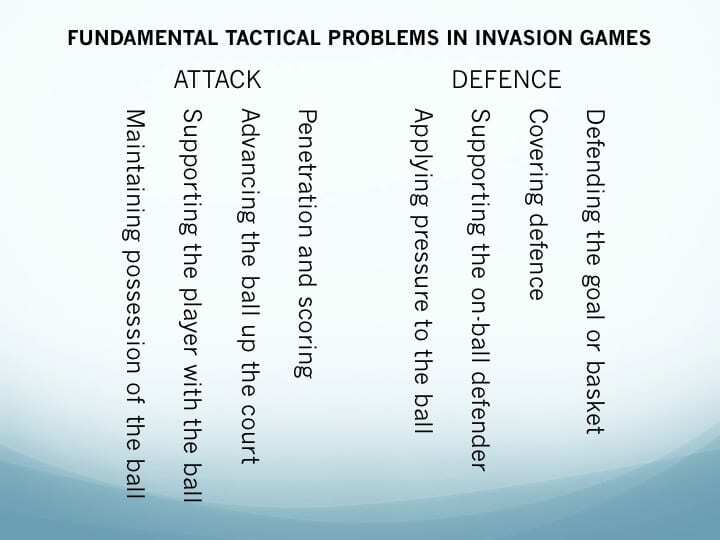 In the example of basketball, “the main themes” are the fundamental tactical problems common to all invasion games, as shown in figure 2, below. These problems are, of course, very basic and abstract. Most coaches and teachers, however, are well capable of thinking of ways to develop the idea of penetration and scoring, for example, over the course of three terms (or seasons). You may begin by teaching the use of a simple attacking dribble in the 1v1 situation in term 1, before moving towards the performance of a screen and roll in a 3v3 situation by the end of term 3. This is all fine in theory, but one thing Bruner doesn’t quite explain is that different learners appreciate solutions to problems and develop skills at different rates and often face barriers to understanding with each journey through a loop of the spiral. To better appreciate how learners move from surface levels of understanding to deeper levels, the notion of ‘threshold concepts’ can be instructive. 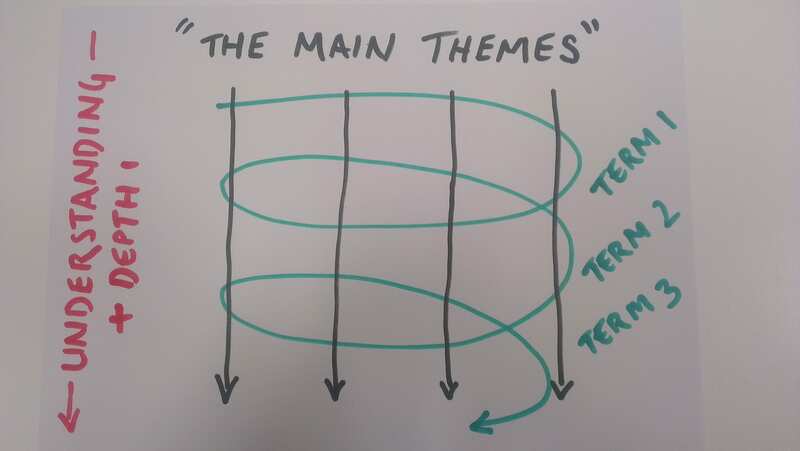 Imagine now that we were to zoom in on a single “main theme” from figure 1 (above), let’s say covering defence. Negotiating this problem – how to provide adequate defensive cover when on the opposite side of play to the ball? – is important in all invasion games, but basketball has a particularly useful concept known as ‘helpside’ defence that is taught as part of a man-to-man defensive system. When I first learned about ‘helpside’ positioning at a summer camp aged 15, it immediately transformed my understanding of team defence. Switching between stances and positions as the ball moved from side to side quickly became second nature to me. I also transfered this understanding into football, and quickly became a much better central defender as a result. 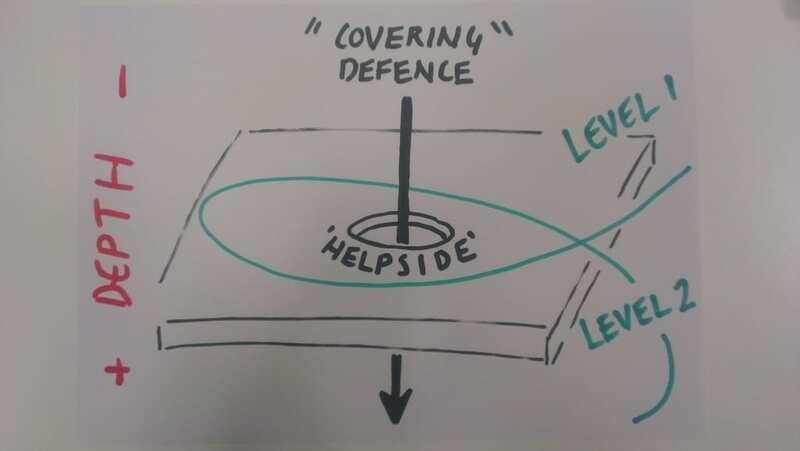 Understanding ‘helpside’ defence is therefore a threshold concept, a “conceptual idea that is essentially both simple and memorable and yet also highly generative in that it contains richly layered implications for all kinds of educational contexts” (Meyer & Land, 2006: p. 7). Threshold concepts are like ‘portals to a new and previously inaccessible way of thinking about things’; they lead to seeing things in a new way; and without them, learners often find it difficult to progress to deeper levels of understanding. Without the concept of ‘helpside’, young basketball players often struggle to understand team defence. They are often capable of defending 1v1, but quite useless when required to defend away from the ball. Figure 3 (below) illustrates how the the two ideas – spiral curriculum and threshold concepts – can be effectively combined to plan for the development of learners over an extended period. It effectively depicts a single “main theme” from figure 1, showing how the threshold concept enables the learner to pass into a deeper level of understanding. Without the portal, the learner remains on the surface. In summary, threshold concepts are transformative, irreversible and integrative (i.e. they expose a previously hidden interrelatedness of things). All sports contain them and it is incumbent on us to identify them and work out the best ways and correct times to introduce them. What threshold concepts will act as the portals to deeper levels of understanding in each theme? …I believe they would have been in a much stronger positon to create comprehensive, coherent, integrated and exciting schemes of work. This is not an easy task. It requires in-depth knowledge of a sport and the patience to think about and carefully plan a spiral curriculum that meets the needs of a range of learners. However, the value of doing this kind of work cannot be underestimated for teachers and coaches who are serious about facilitating deep learning. Bruner, J. S. (1977) The process of education. London: Harvard University Press. Meyer, J. & Land, R. (2006) Overcoming barriers to student learning: threshold concepts and troublesome knowledge. London: Routledge. Connect with your inner DJ: how’s your teaching tempo? Some years ago, I recall a student explaining to me about how important he thought “tempo” was to a coaching session. He was doing his FA level 3 at the time and was reflecting on the value of ‘pace’ and ‘connectedness’ in a coaching session. I agreed with him and immediately began to think about what this would mean in practical terms. Since then, I’ve been searching for a metaphor to illustrate the value and nature of tempo in a coaching session and I think I’ve finally hit on one that works. Build an atmosphere and keep the audience excited about what’s coming next. We can all think of times where a DJ has failed to do these things: when they’ve messed-up a mix to the jeers of the dance floor; when they’ve played a corny track at the wrong time; when they’ve followed-up a floor-filler with a floor-killer; or, at worst, when they’ve lost the plot altogether and left a period of silence or dead air (the classic wedding DJ error). Equally, I recall nights where the DJ got everything right: engaging a club of thousands of people in hours of seamless, flowing music and dancing, linking classics with contemporary favorites in imaginative and interesting ways. This takes great skill and knowledge, of course, with days or months of preparation coupled with the ability to read the crowd and to react to the ‘vibe’ of any given situation. The same could be said of teaching and coaching, I think, though our jobs are made more difficult by the fact that we need to link together whole series of sessions, often over months of even years. Since the 1970s, researchers in PE have shown that time is a critical variable in learning. Indeed, the concept of Active Learning Time (ALT), which incorporates time spent engaged in motor tasks (e.g. practicing skills and playing games), non-motor learning tasks (e.g. answering questions), and supporting others in learning (e.g. peer tutoring), has been shown to be directly related to achievement (Van der Mars, 2006). Maximising ALT is therefore important in two respects: first, in a simple sense, more ALT (or ‘time on task’) means more practice time; and second, by reducing time spent inactive, the teacher or coach reduces opportunities for disruptive behaviour. As Lawrence and Whitehead (2010) explain, the more time participants spend inactive the more likely they are to be disruptive; and more disruption requires time to be spent directly managing behaviour, which is not a good use of the teacher’s time! Research has also shown that, on average, only a relatively small percentage of a PE session is spent ‘on task’. In a review of studies quantifying ALT, Siedentop and Tannehill (2000) found that, as a percentage of total lesson time, ALT ranged from just 10% to 30% on average. Most of these studies use an observation tool called the ALT-PE, developed by Siedentop et al. (1982), which helps to categorise pupil behaviour. Give it a try yourself and see how your sessions compare to the research! How do we maintain tempo? So, like the DJ, we can see that it is important for a coach or teacher to have a good tempo to their session. Maintaining tempo maximises ALT whilst minimising opportunities for disruption. But how is it done? First, there’s the issue of planning and structure. 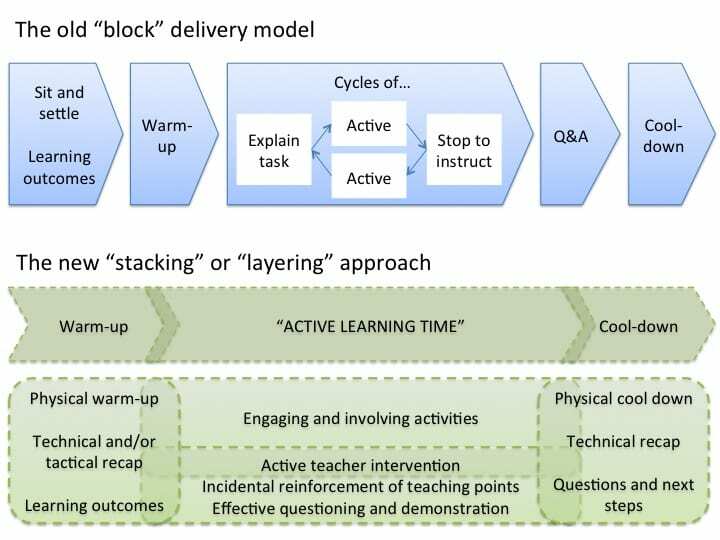 It’s important not to plan a session in ‘blocks’ of activity as the natural breaks between the blocks represent wasted time. There is no reason, for example, why session aims and outcomes cannot be communicated during a warm-up; and no reason the warm-up cannot evolve into an initial game activity, without a break in play. 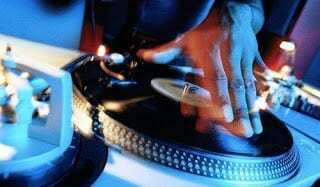 To the DJ this is just good mixing. By way of illustration, the two models below represent two very different ways of structuring and delivering sessions. As you can see, the stacking/layering approach, though perhaps more challenging, would certainly have a better tempo with fewer breaks and much smoother transitions within and between learning activities. Another point made in the research, however, is that ALT, in itself, is not sufficient for effective learning. Indeed, Lawrence and Whitehead (2010, p. 99) warn us not to focus too much on organisation and management, but to “see them as providing time and opportunity for effective teaching and learning to occur”. So, in order to increase the efficacy of ALT, ‘time on task’ is best coupled with particular instruction techniques and formats (Van der Mars, 2006). In particular, curriculum models such as Teaching Games for Understanding and Sport Education have been shown to be successful, as has peer tutoring. It is also important to set appropriately challenging tasks so that when ‘on task’, participants are engaged and not simply going through the motions. These points are reinforced by recent guidance from Ofsted that details the characteristics of ‘outstanding’ teaching in PE (these guidelines also govern sessions delivered by coaches and came into force in 2012). I have abridged the rather long document in the table below and highlighted those points that illustrate the importance of providing opportunities for pupils to work independently and engage in peer-evaluation activities. Communicate high expectations, enthusiasm and passion. Demonstrate high levels of confidence and expertise in both subject and pedagogical knowledge. Use a wide range of imaginative resources and teaching strategies to stimulate pupils’ active participation. Use ICT to support observation and analysis. Ensure pupils of all abilities learn new skills and are able to link them to sequences or tactics. Encourage non-performing pupils to engage purposefully with other roles. Give pupils frequent opportunities to assess their own and others’ performances and make suggestions for improvement. Demonstrate independence of thought and initiative. Learn, practice and apply skills in a range of contexts. Independently explore and experiment with techniques and tactics. Demonstrate leadership skills and competence in a range of roles. Demonstrate high levels of physical fitness and excellent work ethic. Show confidence in evaluating and adapting performances. Show passion and commitment to the subject. Show excellent behaviour, keenness and commitment to succeed. Show ability to grasp opportunities to extend and improve performance. Is broad and balanced, imaginative and stimulating. Is designed to match the full range of pupils’ needs. 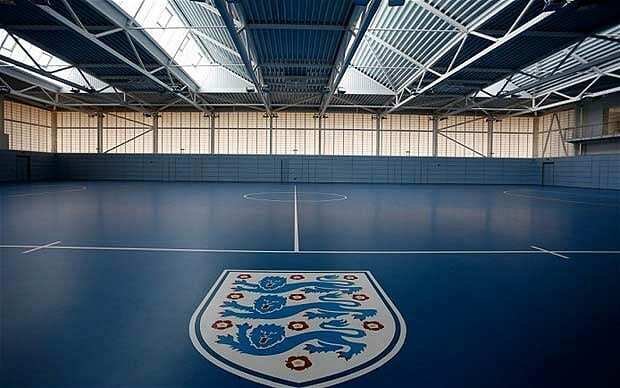 Is linked with the initiatives of other local schools and the wider sporting community. Enables pupils to reach a high level of performance in a range of physical activities. Provides a programme of accredited courses including sports leadership and vocational options (secondary). Has a strong health and safety education ethos. So, to put this all rather simply: those old, blocked sessions filled with stoppages and lengthy speeches simply won’t cut it anymore (at least not as far as Ofsted are concerned). We all need to start connecting with our inner DJs: delivering smooth and seamless sessions, packed with floor-filling activities and layered with incidental reinforcement, quality questions and peer tutoring. In this way we might all be able to get the next generation dancing to a different beat. Lawrence, J. & Whitehead, M. (2010) Lesson organisation and management, in Capel, S. & Whitehead, M. (Eds.) Learning to teach physical education in the secondary school: a companion to school experience. London: Routledge. 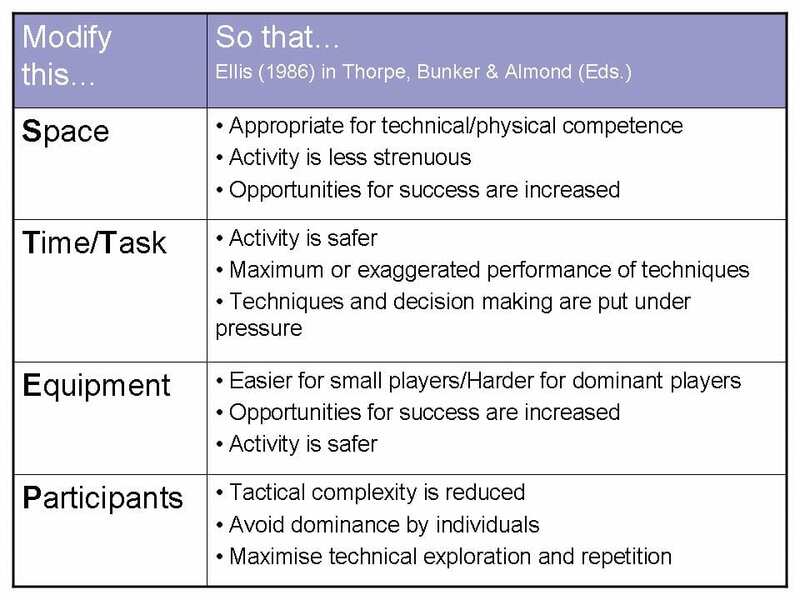 Van der Mars, H. (2006) Time and learning in PE, in Kirk, D., O’Sullivan, M. & MacDonald, D. (Eds.) Handbook of physical education. London: Sage. Siedentop, D. & Tannehill, D. (2000) Developing teaching skills in physical education. McGraw-Hill. Siedentop, D., Tousignant, M., & Parker, M. (1982). Academic learning Time – Physical Education Coding Manual. Columbus: The Ohio State University. Knowing that my new basketballs had yet to be inflated, I deliberately showed up to my session with about 1 minute to spare and made a bit of a scene. Acting out dispair and embarrassment, I asked a couple of students to run off to reception to inflate a few balls, thinking it would set me back about 5 minutes. 23 minutes later, and having decided to start my warm-up without balls, the two – now heavily distressed – students reappeared with the balls and further disrupted my session. A series of additional (deliberate) planning mistakes were then made, which required me to stop the session on numerous occasions to get additional bibs, find a watch, and think of coaching points (that I hadn’t planned, of course). 1. Planning on paper helps clarify things in your head. Even though I’ve been coaching fairly intensively and frequently for 15 years, I still plan every session on paper. Every session. Without fail. Said plans rarely make it our of my pocket, but it’s comforting to know it’s there. So, even for experienced coaches, planning is important to get your ideas straight about what you intend to do, what content to include, how long activities will last and what questions you want to ask. Just because you don’t explicitly use a plan, doesn’t mean the process of creating it wasn’t useful! 2. Planning against clear learning outcomes is a great place to start. In this example, taken from a multi-skills session we did, our broad theme was ‘cognitive’ abilities. We wanted our activities to give the children opportunities to demonstrate cognitive abilities, which we noted specific examples of in the final column to the right (above). This is especially useful in a complex session where you want learners to meet a range of potential outcomes and to keep track of them whilst delivering activities. The main point here is that we had a fairly clear idea about what we wanted the children to be able to DO by the end of the session. This makes it much easier to create appropriate activities (or to steal them from Raising the Bar, in the example above). 3. Having a standard method of structuring a session plan is helpful and reminds you of important details. 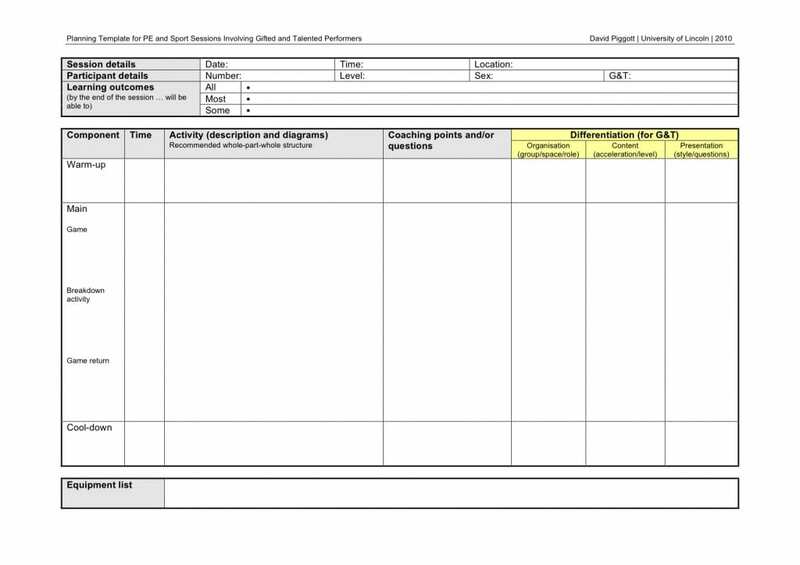 I developed this template with some year 3 students a few years ago as we were exploring how to better cope with gifted and talented pupils in PE. Some of the research suggests that teachers rarely plan to differentiate within a session, especially to stretch the more talented performers. We thought we should add a whole section to the plan (the yellow columns, above) to prompt us to think about strategies for differentiation during every activity. This is now the template I use by default when delivering school-based sessions. If you show a teacher that you’re using something like this when planning your sessions they will be mightily impressed!